I heard this yesterday, and I have been singing 'Baby it's Cold Outside' ever since Glee did their version on the holiday show. (do you watch Glee? I do love how it embraces the arts) How lucky you were to have seen her perform! Thank you for your comment- you have a very good eye to catch the red knobs/rug! I thought of you the other day- the current issue of House Beautiful did a 'Send a Picuture' on Bookcases.... and I immediately thought that your bookcase should of been included! Hi Joan- I have only seen Glee a few times in friend's homes, but don't cable (reception is impossible without it, and try not to watch TV, otherwise, I'd never get a stitch of writing done! It's a great show. And thank you for thinking of me and the bookcases. Books really do make a room, don't they? Thanks for posting this tribute. by how she improved with age and I recalled a radio programme in which Margaret Whiting told Alec Wilder of an unfortunate period in her career when all she was doing was being "little Miss Showbiz". Caught it before it consumed her, and then returned to singing intimately and directly. Or, as Wilder phrased it, as though she was confiding a secret. is a fine example of Margaret Whiting's late period~ and my goodness, she sings that song as though it were personal history! I am not familiar with her work, but used to see her around NYC a lot with her handsome husband (boyfriend?). She seemed very nice and was always gracious with her many fans. Toby- confiding a secret is an excellent way of putting it. That's how here singing struck me when I heard her live. It was a big secret in fact! Nothing small about her. Classicist- her beau was none other than Jack Wrangler. And you know what? My experience is that the greatest of the greatest are always gracious with their fans. Margaret Whiting will be sadly missed...especially by my old record player in my sitting room where I played her songs over and over again. Moonlight in Vermont is an interesting rendition by her but I prefer Sarah Vaughan's version. Yet, when Whiting sings "But Beautiful" with the words..."Love is funny or it's sad..." it just takes my breath away...what a beautiful, evocative voice! No wonder why her voice is so perfect when it comes to interpreting lyrical ballads. 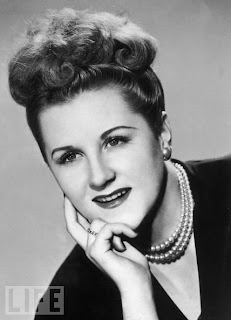 I learned about her in listening with my father to his recordings of the 40s and 50s. Young and untrained, oneself, I was glad to hear someone who gave my father pleasure in this happy way, and so she did for me although for "reasons" we would call extraneous. They weren't, they aren't, she isn't.